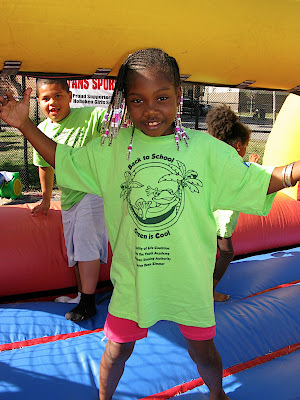 The "Back to School - Green is Cool" block party was held today at the ball field at Jackson and 4th. It was a beautiful day for it and the kids clearly had a good time. The block party was organized by the Hoboken Quality of Life Commision, the Save the Youth Academy, the Hoboken Housing Authority, and Hoboken P.A.L. with the goal to raise funds for back-to-school supplies for the children living in the Housing Authority. Click on the picture to see more pix from the event.